Shame on the politicians that comprise the International Olympic Committee. Give them one minute of silence. They say they wont do so because it would be political. They did politics tonight. They spent 10 minutes celebrating the UK's NHS, their socialized medicine!!! Underwater Music Festival puts the bands on the water on a barge for an audience of boaters. Unique. It was/will be in Carr Inlet of South Puget Sound, which is the west side of Gig Harbor. Specifically between Cutts Island, Raft Island and Kopachuck State Park, which is on the Gig Harbor Peninsula. They had to cancel this year, but are committed to 2013. Map: You can click the minus to zoom out and drag to get the bigger picture. Is it news that a young woman died as the result of an abortion? In a Planned Parenthood clinic? It gets short mention in the local newspaper, in Chicago. It is not news in Seattle; I checked. Last winter/spring everyone told us that Planned Parenthood just provides health services to women. A woman died of injuries she received during an abortion at a local Planned Parenthood clinic Friday. Tonya Reaves, 24, of the 1500 block of N. Kildare, was pronounced dead at 11:20 p.m. Friday at Northwestern Memorial Hospital, according to the Cook County Medical Examiner’s office. She was taken to the hospital from the Planned Parenthood clinic at 18 S. Michigan Ave.
Calls to local and national Planned Parenthood offices were not returned. Did US government invent the Internet? Everyone knows the government in the body of Albert Gore, Jr., invented the internet. Listen to President Obama. Wrong! ; the government's role was small. The US government let a key technology languish for 30 years before private industry made use of it in 1995! And the internet took off only then. … It's an urban legend that the government launched the Internet. The myth is that the Pentagon created the Internet to keep its communications lines up even in a nuclear strike. The truth is a more interesting story about how innovation happens—and about how hard it is to build successful technology companies even once the government gets out of the way. For many technologists, the idea of the Internet traces to Vannevar Bush, the presidential science adviser during World War II who oversaw the development of radar and the Manhattan Project. In a 1946 article in The Atlantic titled "As We May Think," Bush defined an ambitious peacetime goal for technologists: Build what he called a "memex" through which "wholly new forms of encyclopedias will appear, ready made with a mesh of associative trails running through them, ready to be dropped into the memex and there amplified." That fired imaginations, and by the 1960s technologists were trying to connect separate physical communications networks into one global network—a "world-wide web." The federal government was involved, modestly, via the Pentagon's Advanced Research Projects Agency Network. Its goal was not maintaining communications during a nuclear attack, and it didn't build the Internet. Robert Taylor, who ran the ARPA program in the 1960s, sent an email to fellow technologists in 2004 setting the record straight: "The creation of the Arpanet was not motivated by considerations of war. The Arpanet was not an Internet. An Internet is a connection between two or more computer networks." … Xerox's copier business was lucrative for decades, but the company eventually had years of losses during the digital revolution. Xerox managers can console themselves that it's rare for a company to make the transition from one technology era to another. As for the government's role, the Internet was fully privatized in 1995, when a remaining piece of the network run by the National Science Foundation was closed—just as the commercial Web began to boom. Economist Tyler Cowen wrote in 2005: "The Internet, in fact, reaffirms the basic free market critique of large government. Here for 30 years the government had an immensely useful protocol for transferring information, TCP/IP, but it languished. . . . In less than a decade, private concerns have taken that protocol and created one of the most important technological revolutions of the millennia." Why, Harry? If tax increases are of essential importance why didn't you raise them when you controlled everything from January 2009 to January 2011? Weekly Standard asked Harry. He doesn't know. Leadership? Harry hasn't done a budget in three years. The law requires him to do a budget. What does he care what the law says? TWS: Leader Reid, when it comes to the Bush tax cuts...why didn't Senate Democrats push through this bill back when you controlled the Senate, the House, and the presidency? REID: The tax cuts weren't about to expire then. So that's why we're doing it now. TWS: You could have foreseen this issue two years ago. REPORTER: What are you talking about? They expired at the end of 2010. REID: And that's why they were extended one year. TWS: Why didn't they vote when you could have pushed this bill through and had it signed into law? Harry Reid - the best the Democratics have. ?? Anacortes is a great little city. It has water all around and six marinas. It has views of islands near and far, or Mt. Baker and the Cascades and of the Olympics. And it has a gem - Washington Park. I first saw something unbelievable there. At sea level there are rocks that bear scratches from the glacier that covered Puget Sound to past Olympia in the last ice age. … Washington Park, a 220-acre mostly wooded gem of a park 0.7-mile west of the ferry landing. It's at the far northwest tip of Fidalgo Island, jutting out on a finger of land called Fidalgo Head. Along with a 73-site campground, the park features a picnic area, a boat launch and several miles of trails that crisscross the park's forested interior, which is home to some 100 species of birds. A geologic wonder as well, the peninsula is largely composed of greenish serpentine rock, which weathers into a rust-colored soil that's toxic to many plants. Thus, only certain plants and wildflowers — Blue-Eyed Mary and Pod Fern, among them — can survive on its windswept meadows. But the park's true calling card is perhaps its 2.2-mile loop road that explores all that the peninsula has to offer: rocky shoreline and tidepool beaches ripe for exploration; forests of fir, cedar and island-esque madronas; bluff-top meadows and grassy knolls, and just about everywhere, water views to the surrounding islands and far-off mountains. Numerous pullout spots with park benches and/or beach access invite visitors to stop, ogle the views and smell the saltwater, as it were. Along with folks in cars (speed limit: 10 mph), the one-way, one-lane road is beloved by walkers, cyclists, families — pretty much everyone. The photo - Mt. Erie, about 900 feet tall, is in Anacortes! I don't recall where I got this photo. Arrogant Obama claims credit for everything. Well, not all credit for himself, but all for him and his government. "If you've got a business, you didn't build that," Obama said. "Somebody else made that happen." Oh? John Podhoretz says that there are 21,700,000 businesses that have no employees but the owner/proprieter. Tell those hard-working people that they didn't build their business - that you did, Obama. Go ahead, tell them. And ask them to vote for you. Graphic is from Didn't Build That. Click to enlarge. The 1996 welfare reform was immediately successful. It got people to work and they were better off for it. Poor Obama was constrained; he couldn't give out all the favors he wanted. The 1996 welfare reform requires people to work. Obama wants to give hand outs to people who sit. So why would he let that law get in the way. Why ask Congress to pass the law you want when the Chicago way is to do whatever you want - no matter the Constitution. So Obama arrogantly is not enforcing part of the 1996 Welfare Reform Act. The parts he doesn't want to enforce. 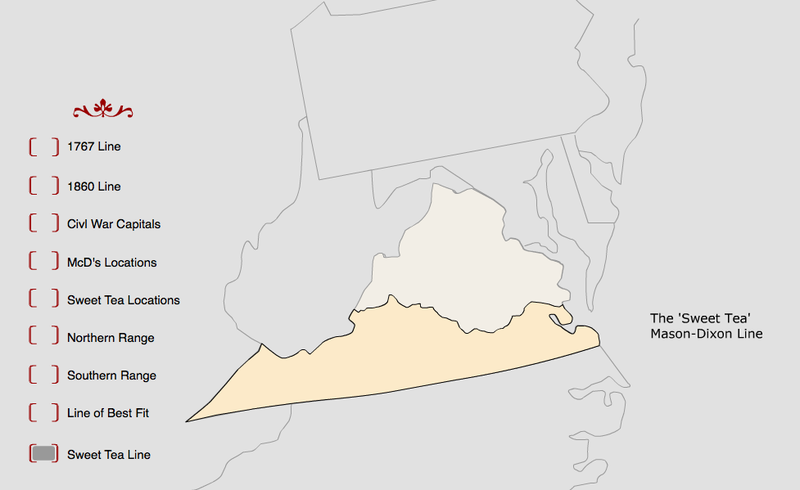 Where does north meet south in Virginia? 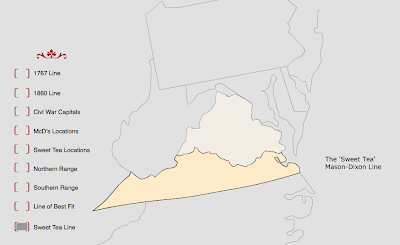 Where does north meet south in Virginia? I wasn't worried about this question, but I discovered an interesting data analysis of the topic - Where is sweet tea served? That is, tea served with sugar in it. At a blog called Eight over Five they got data on what is served at the 300 MacDonalds in Virginia. They have a nice interactive map showing this data and fitting lines to it, plus historic lines, including the Mason-Dixon line. EightOverFive - It is interactive; go try it. Why search for Higgs boson? A cartoon that explains it, at least why is is being sought. Very good. Ambassador Scott Gration set up an office in the laundry area so he could avoid the security on the embassy's computer network. He was an early Obama supporter and appointed special envoy to Sudan. People are moving across the Potomac River from Maryland to Virginia by the thousands, indeed, 40,000 between 2007 and 2010. Why? High taxes. And it's getting worse in MD; they raised the income tax for high earners on July 1. And the individuals moving in many cases are moving because their employers chose more tax-friendly Virginia. The US has made stunning progress by reducing Co2 emissions to the level of 1991 despite population and economic growth. The US "arrogantly refused" to confirm the Kyoto protocol under President Clinton and continued to refuse international agreements under President Bush. But the US kept making progress. The climb leveled off in 2001. Then grew little. Then dropped after shale gas arrived the past 5 years.